The bumper was designed, obviously, to be attached to the front of a VW Beetle. I did not have one of those. So I built little feet, and lag-bolted the bumper to them. I’m missing a few photos here, but I'll try to explain things. I built a little half-moon shaped box with the same curve as the bumper (I traced it on the plywood), then measured to attach a thin piece of plywood to the front. Lots of screws tacked it in place, more or less. I really wasn’t sure it would work, and it only sort of did; it started to bow a little strangely, but I decided I could fix it later (or just live with it). In retrospect even thinner plywood would have been better. But way good enough. 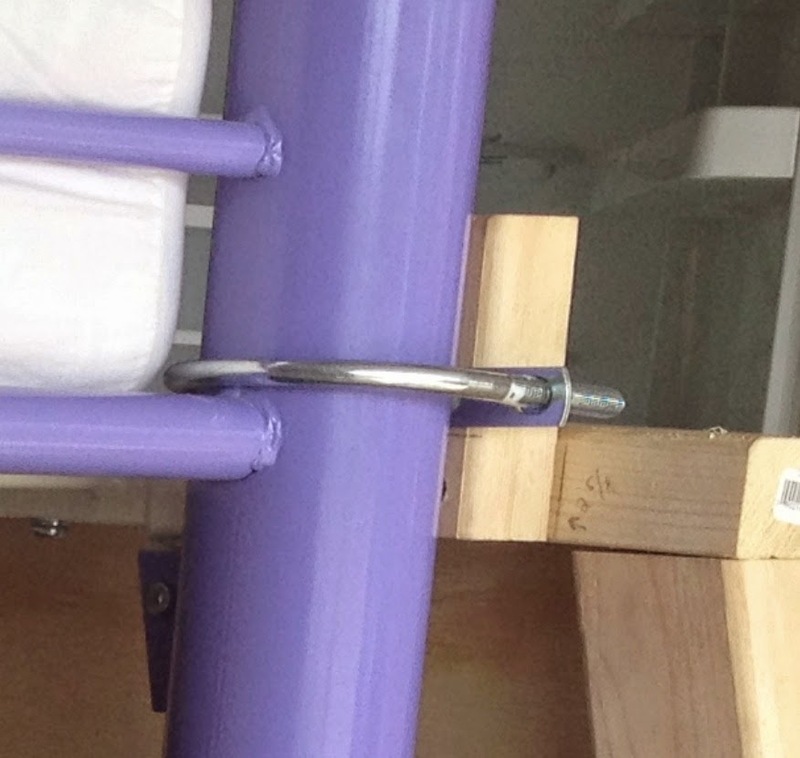 You can also see how I solved the “how do I attach the top of the bus bed side panel” question: little U-shaped bolt dealies. Uncannily they fit around the metal bunk bed posts perfectly; I just used a scrap 2x3 end to space the panel out a bit. I figured it was as good a time as any to attach the plywood onto the side frames, which on one side was just a matter of screwing it into the 2x3s. The "bumper box" was also now a place to stack tools. For better or worse. On the other side, I needed doors. I built those using my now-standard double-drilling technique as well. Then I cut plywood to fit the doors, and hung them with simple hardware store hinges. It was starting to look a little bit like a minibus, if you used your imagination. Next the VW bus bed needed windows!